This score sheet is my projected final score, give or take 25 points depending on customer votes. After dealing with the flu last week (a price I should’ve expected to pay when seeking the patronage of Father Nurgle…), I’m back to the grind. The pressure is mounting, as my timeline gives me 40 days left (the goal is to have my entry ready to be judged on May 10). It’s time to get schwifty. This is a guide to making a renegade himself, with a full list of paints and a break down on how to apply them. 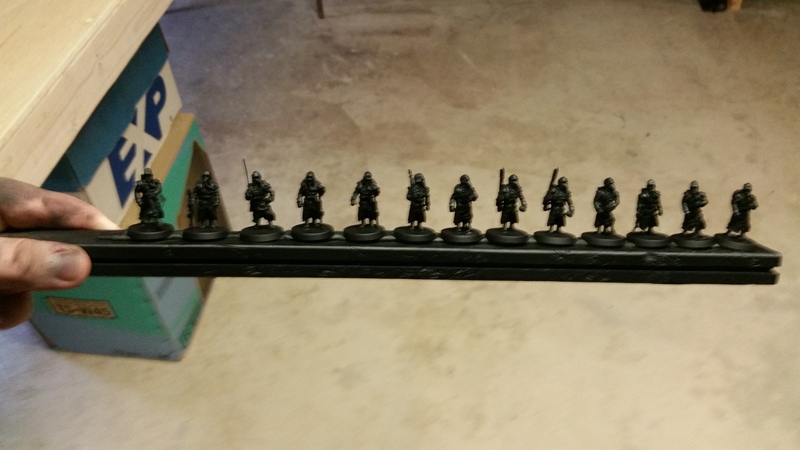 First, I prime my infantry with Chaos Black spray. For the sake of time and good coverage, I use a spray stick. It’s a random wood scrap that suits my needs, not too short or too wide, that I line with sticky tack pressed down firmly on it. Sticky tack is better than double sided tape in my opinion, as it’s reusable and grips your bases better. 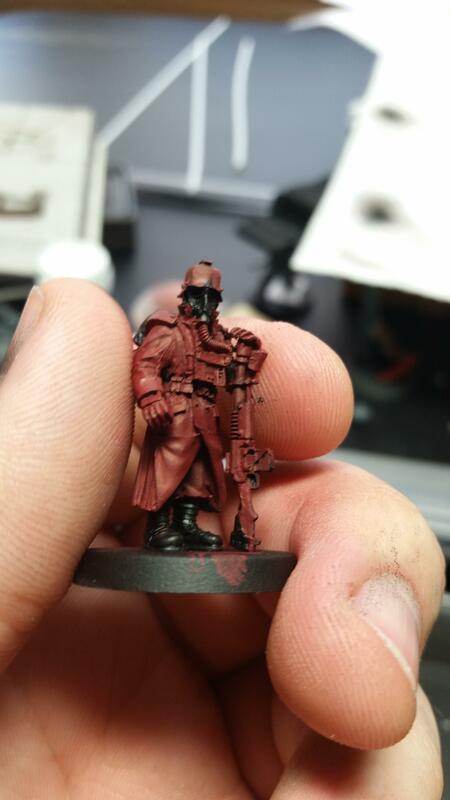 After they’re primed, the models are basecoated with Khorne Red using a large base brush focusing on the trench coats. In order to ensure that my batches continue marching on, I’ve enlisted the help of a good friend and fellow hobbyist to aid me. 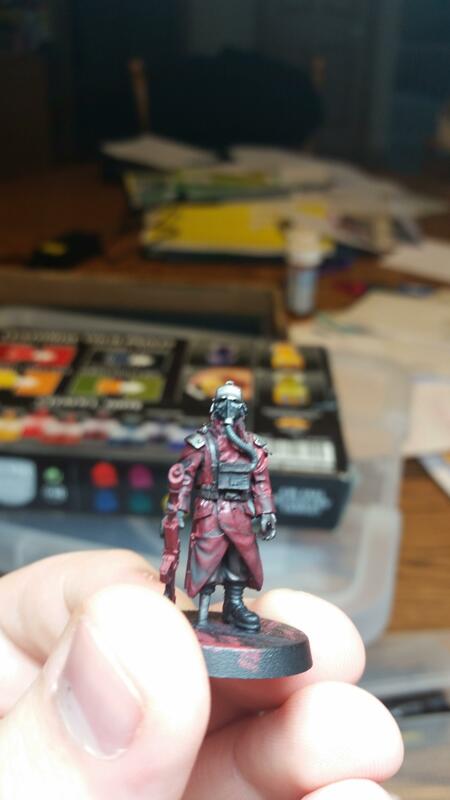 Specifically, my friend will be aiding me with an airbrush, so that all my infantry can be quickly base coated red. By brush, using Khorne Red as a base, it can take up to three thin layers to get a smooth, strong, and complete coverage. With the aid the airbrush, hours of time can be saved. Then, the other details on the model are colored in using a medium or small layer brush depending on their size. Metal parts such as the helmet, buckles, lenses, and the containers on their backs are painted with Leadbelcher. Backpacks, pouches, straps, gloves and their pants legs are painted with Rhinox Hide. 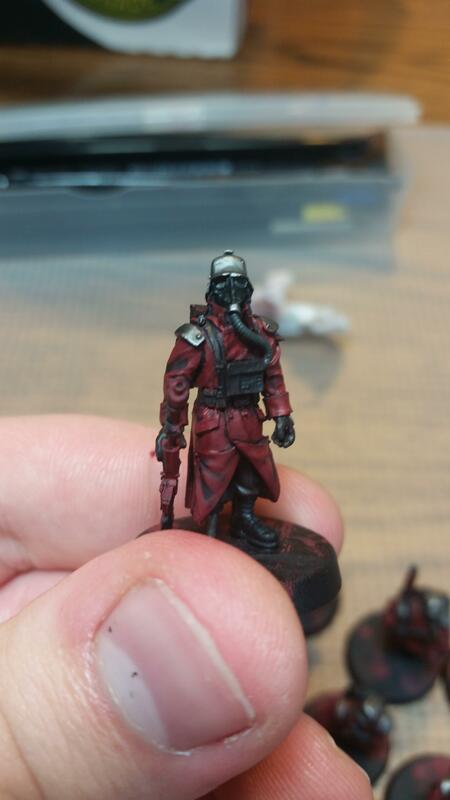 Gasmasks, boots, and bed rolls are painted using Abaddon Black. 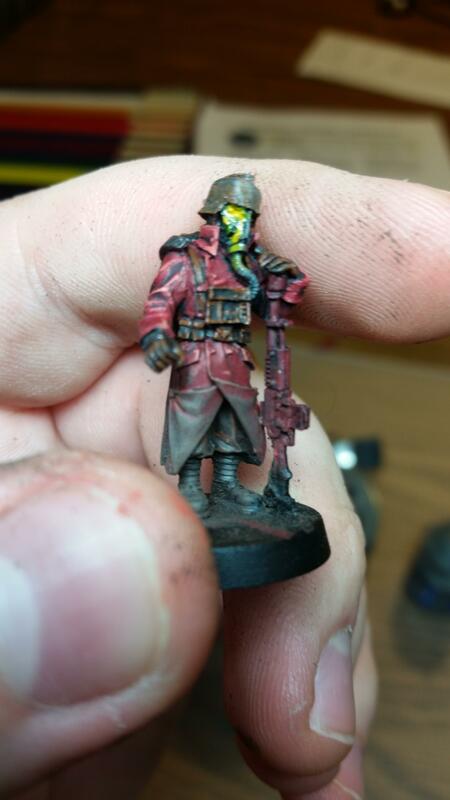 The tubing for the gas mask is painted with Skavenblight Dinge. Next, the entire model is shaded using a medium shade brush with Nuln Oil. Just ensure it gets in all the recesses and doesn’t pool heavily on the model. 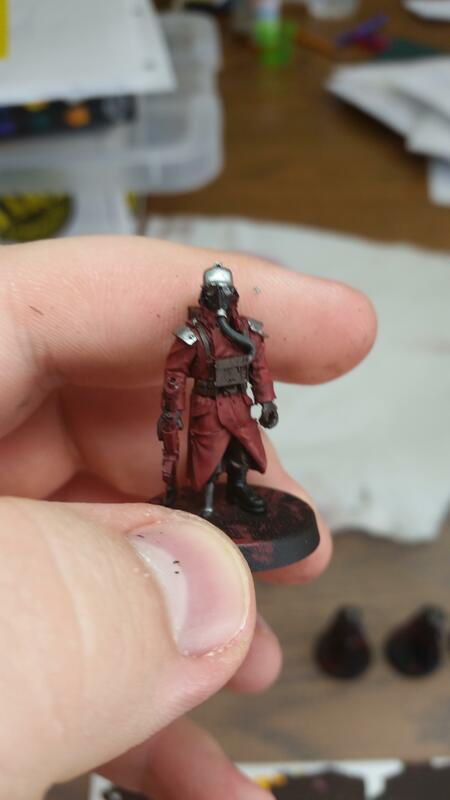 Once the shade has dried, the trench coat is layered again with Khorne Red, avoiding the recessed areas of the coat. The next step is the corroding and weathering the large metal bits of the model, excluding the lenses and gas mask nozzle. This is done after the trench coat is layered over so the inevitable fixing the coat afterward is easier. The point of the weathering is to be consistent enough to keep a cohesive look, but still have variation to emphasize a sense of realism. Every step here comes with judgment calls: it’s up to you how much or how little of each step you do and how you go about doing it. First, the metal is given a moderate coat of Typhus Corrosion. This is a technical paint that contains grit and is normally used on large models like vehicles, so use a medium layer brush and being sure not to simply glob it on. Next, quickly use your finger to remove and smear the Typhus Corrosion. How quickly you do it will greatly influence how much grit and grime color will be left on the metal. Using your finger instead of tissue paper is important because you will be quicker and more effective. After the metal has been properly corroded, use a small layer brush to apply Typhus Corrosion again, but this time strictly to the recesses and around the rivets found on the helmet. Then, using a small drybrush apply a somewhat heavy coat of Ryza Rust onto the helmet and canister. The other bits are far too small and flat to be drybrushed for any noticeable effect. Focus on where the grit has given the metal texture. Finally, either Leadbelcher or Ironbreaker is applied using a small drybrush or with a small layer. If you choose to dry brush, be very light and focus on building up the metal appearance while leaving a good amount of the degradation showing. If you go the layering route, you need to thin your paint down with water until it becomes milky and you can see the metal shavings moving around in the paint, then apply it carefully and in a splotchy pattern over the metal, building it up after the first step has dried if needed. You can even use a mixture of both techniques, so long as you are careful to leave the degradation showing. You can either use Leadblecher or Ironbreaker for these steps, but do not apply both on the same model and try and keep an equal ratio of models that you used Leadbelcher for and models you used Ironbreaker for. The explanation for why to do it this way if immeasurably longer than actually putting it into practice, so don’t be intimidated to try it out. Now comes the highlighting for the model, all applied with a small layer brush. All the black parts were highlighted with Skavenblight dinge, then given a penultimate highlight of Eshin Grey. Eshin Grey was also used to highlight the raised parts of the tubing. Then, all the brown parts were highlighted using Mournfang brown. 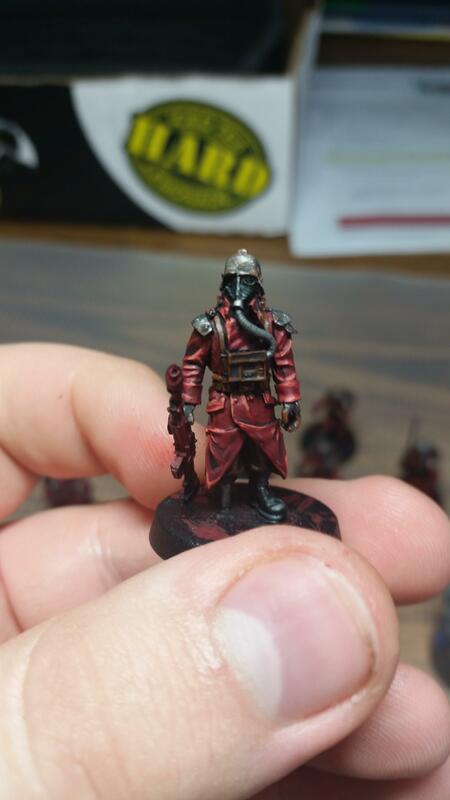 Finally, the red trench coat was highlighted using Wazdakka Red and given a penultimate highlight of Squig Orange. The last bit of weathering for the model is next, this will illustrate the mud and dirt they’ve been in. With a medium drybrush, apply a bit more than moderate level of Dryad Bark to the trench coat and legs, stopping a little short of the belt. This won’t be a true drybrush, as you want the paint to be a little bit wet when you apply it to give it a strong mud look while not entirely covering the colors under it. 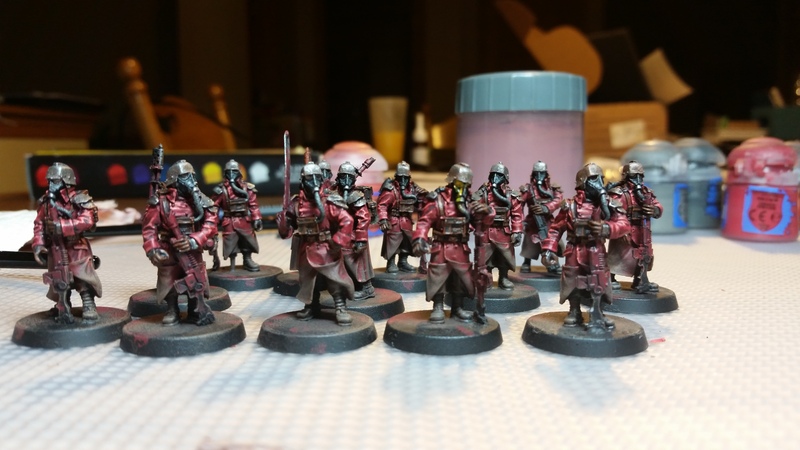 Afterwords, apply a traditional drybrush of Steel Legion drab with a small drybrush, then a lighter dry brush of Zandri dust over that. Lastly, we will finish off the model by filling in the lenses and adding the goo effects. The goo effects are only applied to lenses that were damaged when cleaning out chunks of resin from them, to give what could have been a glaring flaw on the model the appearance of a broken and leaking lens. For the normal lenses, using the tip of a small layer brush, a coat of Averland Sunset is applied. Then, using the XS Artificer brush, a small circle of XV-88 is applied to the left of the lenses, followed by a crescent shape of Yriel yellow to the bottom of the lenses, finished by a dot of White Scar in the center of the XV-88. The lenses then receive a coat of Ard’ Coat to give it some shine. For any goo effects, Averland sunset is still coated in the lens, but then applied to the mask in small streaks till a solid drip look is made. Then, the goo is applied over it and slightly beyond the Averland pattern. The goo that I use is actually a custom made paint, created with a pot of Ard’ Coat mixed with pigments from the Artificer Tint Set, which I will go into the making of at a later date when it is used more heavily. With that, the renegade himself is complete, with just his weapon and base left to finish, but that is a story for another day. I love the red. I love these minis too but they’re so expensive from Forgeworld. Especially because I’m in Australia. Thanks! Also yes, they cost an arm and a leg.